Throughout the decades since the first heat-styling appliance for at-home use was invented, we have seen the steady evolution of styling trends. Blow dryers gave us high lift, full volume styles. Hot rollers gave soft cascading curls. Curling irons allowed the creation of precise, crisp ringlets; and flat irons smoothed otherwise unruly curls. Each look has had its heyday and has resurged at different points in the intervening years. In the 1980s, we saw a different texture to the mass of curls that was the trend. Pop/Rock stars were sporting kinks in their hair. This was possible thanks to the invention of a specialized heated tool – the crimping iron. Credit for the creation of the crimping iron is given to Geri Cusenza who invented the crimping iron in 1972, reportedly for use with Barbra Streisand’s hair. Unlike curling irons and flat irons, the crimping iron was designed to add a “wave” to the hair, much like the effect of braiding the hair while damp and setting the wave by allowing it to dry while braided. The crimping iron has the benefit of being a faster process and offering sharper, cleaner bends in the hair strand. • A Crimping Iron with adjustable heat setting. As with any heat styling procedure, you want to start with clean dry hair. The hair should be treated with a heat-protection product and dried fully before using any heated appliance on it. Remember, the high heat of the iron will flash boil any water left in and on the hair, so if your hair isn’t completely dry when you iron it, you can end up with poached hair. When the hair is ready to begin, separate the hair into sections and clip the sections out of the way securely. You should have an idea of how you want the finished style to look, and you should feel free to form the sections to suit your plan. The only rule of thumb is to make sure that the sections are narrower than the length of the heating plates, since that will make it possible to work through a section more easily. 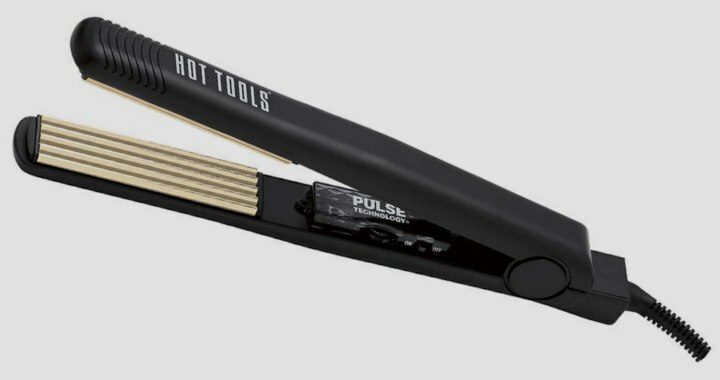 As we’ve said before with other heat styling techniques, it’s important that the heating plates of the tool used are clean, and at the appropriate temperature. To test the temperature of the heating plates to make sure they aren’t too hot, moisten a piece of tissue paper (end papers for perming the hair are perfect for this use) with your spray bottle of water or dampened sponge, and press it between the plates of the iron for five seconds. The tissue should come out clean, dry, crisply-pressed and without any scorch marks or browning of the paper. If the paper is discolored, then your iron is too hot and you should adjust the heat until the test paper comes out clean and unmarred. If there are signs of residue on the paper or the heating plates themselves, use a damp cloth to clean the plates. Remember that residue can cause the hair to stick to the plates and lead to overheating the hair, burning and damage.